We all catch feels, but none with more open arms than Serra’s Founder and Brand Director, Cambria Benson. Born and raised in Portland, Benson walks the line between business development and brand recognition, steering brand identities as vastly different (and fully-realized) as those of Serra and Electric Lettuce. 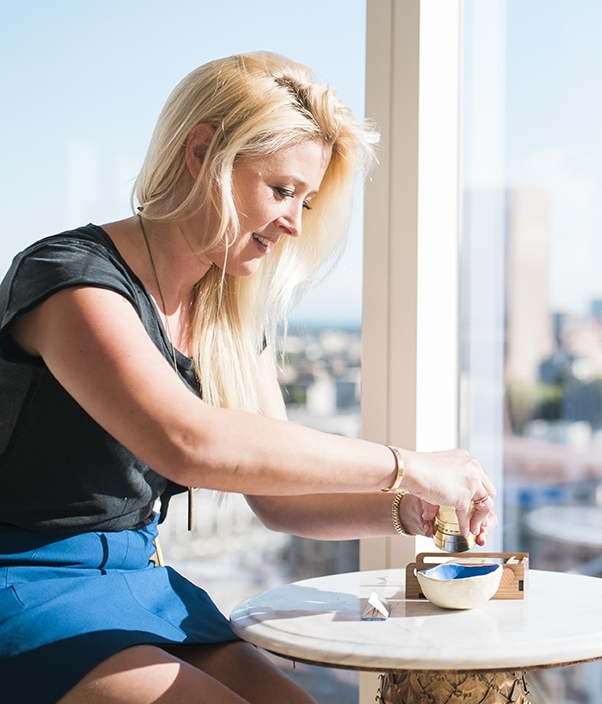 Keeping in tune with her state of mind is essential while negotiating a career, quality time with her toddler, and creative space to herself, which is exactly why we talked to her about finding inspiration and balance through cannabis. Describe the inspiration around crafting a brand like Serra. Was there a light bulb moment? CB: There wasn’t so much of a light bulb moment more of an ‘aha’ period. I was dealing with chronic pain for the first time and using cannabis more and more, but I still felt very intimidated by the cannabis retail scene. I had a hard time finding brands and retail spaces that resonated with me as a female consumer. Adult use legalization was just around the corner, so it was the perfect moment to create a beautiful retail experience; an environment designed to put customers at ease and a model focused on education, without pretension. At the start of the year, resolutions are on all of our minds—spoken aloud or not. What are you resolving to do more/less of in 2019? CB: Be more present in my life at home and put the phone down! Having our daughter this last year has put so much into perspective. I want to be more present with her and enjoy every moment because it passes so fast. What are the magazines, books, or podcasts that inspire you? CB: Pour Your Heart Into by Howard Schultz (billionaire; former CEO and current Chairman Emeritus at Starbucks; former board member at Square, Inc.; and potential independent Presidential candidate in 2020). That’s the book most inspiring to me as it relates to business. But reading and podcasts are really when I get to escape, and get away from the business side of things. My favorite books of all time are still the Harry Potter series. How has your relationship with cannabis changed over time? CB: From high school to my twenties, cannabis was pure recreation for me. It was relaxation and happiness. Then I had two ankle surgeries in two years and developed chronic pain due to a nerve complication, and the medical value of cannabis became invaluable to me. The pain relief I found from cannabis encouraged me to explore strains that treated my ADHD and anxiety as well. Now that I’m a mom, I’ve been micro-dosing at the end of a long day. It helps me decompress and be present; be more in the moment with my daughter. As a brand director, mom, creative force, and more, how do you take time for yourself? CB: Self-care for me is stolen moments throughout the evening. I love to cook, it’s a great creative outlet that also lets me unwind. I watch HBO. I love just relaxing and reading the news--I have a major obsession with the Daily Mail. Movie theater vs. Netflix-and-Chill: What’ve you been watching? CB: Netflix all the way! There is no better movie theater then our couch! My favorite show is Game of Thrones (less than 3 more months!!!). Besides that, I enjoy watching historical fiction series, and I just got done binge watching You, which was so good. How do we keep it fresh with all the cannabis industry changes? CB: We are in such a rapidly changing industry that it gets hard to not get caught up in the ‘next big thing’ or follow the next big trend. I think it’s more important to stay true to our values as a brand and a company, and avoid getting caught up in every moment. It’s important to shift when necessary, but its most important to be authentic to who you are and how you represent your brand to your consumers. Authenticity is so important and I think it’s easy to see through it when we stray from our principals. That being said, Serra is a brand that places such a huge value in creativity and art, I think it’s good to draw inspiration from what’s happening in art, design and beyond the cannabis space. How do you see cannabis changing in the future? CB: Cannabis is such an amazing product because yes, it’s relaxation; yes, it’s recreation; yes, it’s medicine. At the heart of it, cannabis is self-care and I think we will continue to see products developed and the mainstream consumer industry shift in the mentality that frames it in that way.